The games don't count, but Aaron Judge is having an out-of-this-world spring in the Grapefruit League. 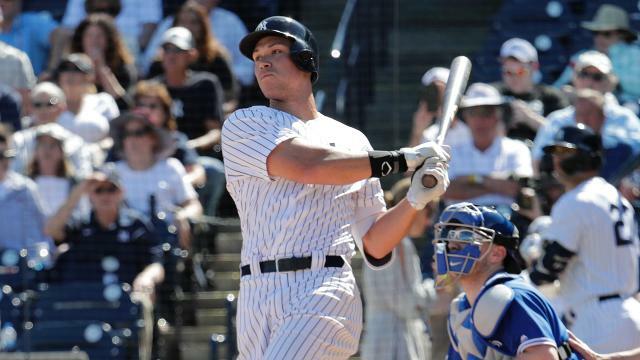 In 30 Spring Training at-bats, Judge has 10 hits and leads all of baseball with six home runs. His other four hits have gone for extra bases, and he's tied for fourth in baseball with 12 RBI thus far while also drawing four walks. Before anyone praises spring stats, it's worth noting a few things. These stats don't factor into regular season performance, nor do they necessarily project success. Pitchers who would otherwise be incentivized to pitch around Judge instead are working on parts of their own game and may be more willing to air it out. Some of his homers are coming off Minor League competition. Judge, however, has been impressive regardless of those caveats. His early production paired with his reputation prompted the Blue Jays to use a four-outfielder alignment against him Saturday, though he beat the shift by simply hitting it over the wall. Aaron Judge HOMERS ... again! Entering his third year, Judge got the chance to have a complete offseason to prepare for the 2019 campaign. Last season, he got a slow start to camp after undergoing shoulder surgery over the winter. It delayed his spring debut. Even though the surgery didn't lead to ill-effects on his regular season, it prevented him from working on certain parts of his game. With the ability to make more adjustments in the offseason, Judge has taken full advantage, most notably with two strikes. The 6-foot-7 hitter has made efforts to cut down on his strikeouts from the last few seasons and eliminated his leg-lift and stride once he gets down two strikes. Judge has still fanned eight times in the spring, but he's also hit multiple two-strike homers, depositing them to all fields. A fully healthy Judge could mean trouble for the rest of baseball. The Yankees set a Major League record with 267 home runs despite Judge missing more than a month of the season. Even while playing four-and-a-half months, Judge went deep 27 times and has 79 long balls in the last two seasons. Could the outfielder reach new heights this season? It's not out of the question. Pitchers can't pitch too carefully to Judge. His intentional walks decreased in his second season, in part thanks to having Giancarlo Stanton one spot behind him in the lineup. He still posted a top-10 walk rate in all of baseball after leading the league with 127 free passes in his rookie season. Opposing teams are certainly scheming new ways to outfox Judge, as evidenced by Saturday's four-man outfield the Jays utilized against Judge and Greg Bird, who walked and singled against the shift. Whether it's extreme shifts or trying to bust Judge in towards the knob of the bat, he's going to be tested by the best that pitchers have to offer … or pitched around when the opportunity arises. He doesn't have the chance to sneak up on the league as he did in 2017. Regardless of what the opposition cooks up, Judge remains the Yankees' most important hitter. The Yankees' swoon last August with him out made that reality concrete in everyone's mind. Even though his spring numbers don't carry over to the regular season, the adjustments he's made in Grapefruit League could portend a hitter firing on all cylinders come Opening Day.